Awesome cabinet pulls that I am attempting to buy. I’m just waiting to see if they have enough. Cheap enough, too, thankfully. 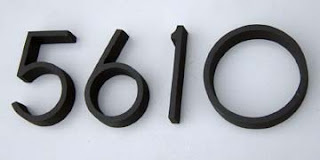 This is an escutcheon–a fancy name for the backplate that goes behind your doorknob. They were very common in the 50’s. 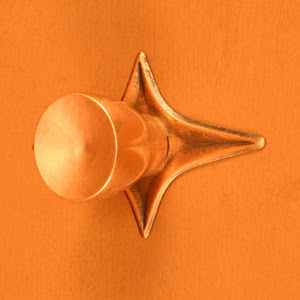 This sucker is on ebay for $100–not the doorknob, just the starburst thingy. I’m so very tempted but that just seems like a lot. What is also cool is where the doorknobs were placed. Just slightly to the center, instead of lined up with the deadbolt. 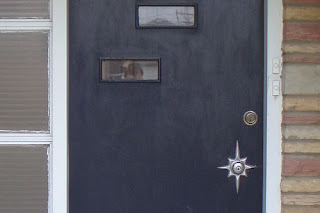 According to Crestview Doors, it was called “Sputnik”…. I so want to do this! It just looks so great to me. 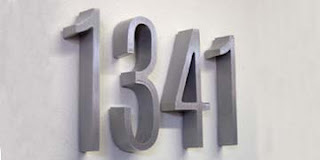 I’m also looking at house numbers. I really am flopping back and forth between my current (original) numbers and one of these designs. I think for our house the bottom one is more appropriate, though what could be most appropriate than the ones that were on there when they built the house? I don’t know. Decisions, decisions. Please forgive the crap photos, G is at his high school reunion this week and snagged the good camera. 1) Go to your garden or your veg drawer and find some stuff. I had tomatoes, zucchini, garlic, basil and oregano. Chop all the veg and herbs up in uniform pieces, and slice the garlic very thin. 2) Boil some water with lots of salt and cook the pasta as directed. 3) Heat some olive oil, 3 Tbsp or so, and add garlic. Cook until fragrant. 4) Throw all your vegetables in the pan. Add salt, pepper, oregano and chili flakes. Cook 5 minutes or so, until veg is tender. 5) When pasta is about done, scoop it up and put it in the saucepan with the sauce, and let it finish cooking, about a minute. 7) Add the basil and some parmesan, salt, pepper and chili flakes to taste.